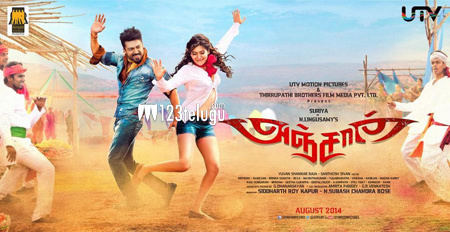 Anjaan team expecting 150 Crores! Big Hindi films are routinely crossing the 100 Crore mark at the Box Office and the mammoth ones are touching 200 Crores. Telugu and Tamil films are now slowly moving towards the 100 Crore mark and it may take some time for that to happen. But the production team of Anjaan is very confident about achieving 150 Crores in Box Office revenues. The film is going to release on August 15th worldwide in three languages – Hindi , Tamil and Telugu. Because of Surya and Samantha’s popularity in Telugu and Tamil, the film is expected to do very well in both languages. In Hindi also, Surya is slowly establishing a small market for himself. All these factors are helping the team’s confidence. The movie is being directed by Linguswamy and Yuvan Shankar Raja is the music director.